Veteran center Jeremy Zuttah went from being the odd man out in Tampa Bay to becoming one of the most welcomed additions on the Baltimore Ravens. Zuttah was traded to the Ravens for a 2015 fifth-round draft pick in March after the Buccaneers signed his replacement, Evan Dietrich-Smith, in free agency. Through the first two weeks of offseason practices, Zuttah has been among the more impressive players on the field. Zuttah's athleticism and intelligence significantly boosts the weakest position on the team last season. Gino Gradkowski, a first-year starter, ranked last among centers in 2013, according to Pro Football Focus. The Ravens don't expect Zuttah to a be a Pro Bowl center. They're not envisioning a dominant one, either. What they need is someone who is solid in the middle of the offensive line, which was lacking last season with Gradkowski. Zuttah, who was No. 22 on PFF's center rankings, could end up being better than he was in Tampa Bay because Gary Kubiak's zone-blocking scheme suits his strengths. While no one knows how he'll hold up physically until the pads come on at training camp, Zuttah has stood out for his quickness and his ability to get to the second level. Offensive tackle Eugene Monroe said Zuttah has fit in "perfectly." "You’ve got to be able to move, you’ve got to be able to run to do what we do," Monroe said. "He excels at that." Zuttah, 27, has started 76 games in his six-year career, although only 31 came at center. Last season was his first full one as a starting center. 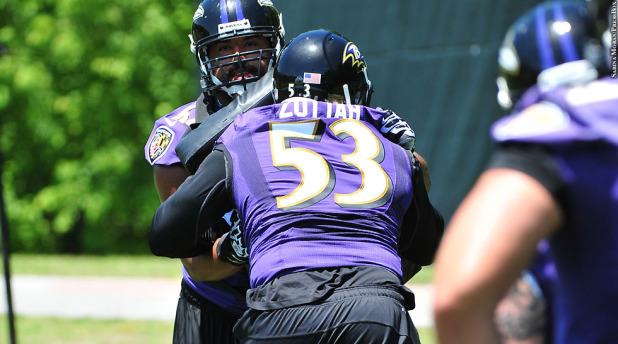 The Ravens, though, have been impressed with how Zuttah has carried himself at that position. "Jeremy Zuttah is doing a great job," Ravens coach John Harbaugh said. "He's smart, really smart, really mature, goes about his business in a mature way. I'm just very impressed with how smart he is." The Ravens signed Zuttah to a five-year, $18 million contract upon trading for him. The hope is Zuttah is a long-term solution like Matt Birk, who started for the Ravens for four seasons (2009-12). If Zuttah works out, they are getting a good value for a starting center (an average salary of $3.6 million). If he isn't as much of an upgrade as expected, the Ravens can part ways with him after the 2015 season.